Before I launch into this crazy true story of mine, there are a few things you need to know about me. First: I’m a planner. I believe more things get done, and are done better, when you plan for them. I’m the kid who, for the middle school band trip to Disney World, created a full-color info graphic for her friends to decide what rides were top-priority and to get everyone excited about all the planned activities we were going to do (much to everyone’s chagrin). Second: I believe, despite perfect planning, our attitude and current environment impact what ultimately happens. Even deeper than that, I believe there are many realities possible in a single moment. That moment right before you have a car crash? It’s been preceded by all the moments in your entire life that have lead you to this singular reality. Think about that for a minute: every. Single. Action. Sound “woo-woo” enough? Maybe by the end of my story, you’ll come around to this idea. Lastly, you should know I’m a mom of two living in Austin, TX since 2008 with my husband of 9 years. Our kids are 2 and (almost) 5, we have a dog and a cat and a beautiful house on a very quiet street. I’m originally from a small town of about 3,000 people in West Tennessee called Somerville, and my parents are still there, living in my great-grandmother’s Greek Revival-style house on Main Street. I have a Bachelor’s in English and a Master’s in Theatre/Playwriting. I tried to plan my life out so that I would never do anything but write. But life had other plans for me: kids, cars, houses, travel, living far from family – things that require me to hold a full-time job that makes steady money. So, I’ve been a conference coordinator for the last 10 years, and it’s given me financial abundance with which to live my life. But something was always missing. Even though I have so much, and am so blessed, I felt restless. I want adventure, in the deep core of me. This comes from spontaneity, which is something that doesn’t come naturally to a planner. I have a deep existential desire to experience transformation. Two years ago, I would never have done the things I’ve done today. I wouldn’t have been as brave. But here I am, ready to tell you the impossible true story of something that happened to me in 2016 that changed my outlook on life forever. Something that encouraged me to be fearless in the face of uncertainty. It was a “lightning moment” that shocked me into a new reality. May it give you hope that your own moment could happen at any time. I stared through the foggy window of my mother’s guest bedroom, just before 9am on Wednesday, February 10, 2016, at a small, unassuming Cruise America RV that was parked across the street by the abandoned elementary school. It was unusually cold outside, and I was exhausted. Just the day before, around 4pm, I had made the decision to pack up myself, my husband, our three-year-old daughter and barely three-month-old son, into our Honda for a thirteen-hour-drive to make it here. Because Billy Corgan of the Smashing Pumpkins said he’d be at my mom’s house at 9am. The day before this fateful morning, I was out and about with my baby Eli. I was still on maternity leave, and my time was my own. I went to HomeGoods and bought some candles. I snagged a grande vanilla latte. I got some lunch at P. Terry’s Burger Stand. The week before, I was having lunch with my husband and baby in tow at a little Mexican place, and there amid the queso and enchiladas, I told him about Billy Corgan and how he was driving around the country to interview people about the “American Dream.” In my fantasy-land of maternity leave boredom, I had written a nice, concise response to Billy’s website’s contact form, suggesting they go to my mom’s house in Tennessee because she has a lot of cool antiques that I knew Billy would like. I put my contact info in the form, hit send, and forgot about it. Would love to know what the availability is of doing interviews in Somerville today or tomorrow if possible. Could you provide me with a contact number for you or your relatives? I did a double, triple, quadruple-take. It was almost 4pm. It was a Tuesday. At this very moment, I had a choice to make. At this very moment, there were a dozen realities swirling in the ethereal sea above my head, waiting to see which one I would choose. So, I called my mom. That was the first step, right?! Mom had to be on board with them coming to her house. My heart was racing. Mom picked up, and I explained feverishly what was happening. Eli stirred in his car seat. He would be awake soon. Mom knew who Billy was, due to my teenage obsession, and she screamed a teen-idol scream. She said yes, of course they could come, but what on Earth…?! So I hung up and responded to Justin, giving them my Mom’s number. I live in Austin, TX, and Somerville, TN is almost a 13-hour drive away. My planner brain kicked in, and I started to do the math. Meanwhile, Justin called my mom, and she graciously said she needed to “vacuum” before they came over, to which he laughed. And they said not to worry - they’d come tomorrow morning, around 9am. My mom told me the details and I started going through scenarios. Not only did I have a three-month-old, but I also had a three-year-old, and a husband with a job. I could take Eli with me and spring for a last-minute flight. But who knows if we’d make it on time. Then I made the craziest decision I’ve ever made. I decided that we needed to drive there. I called my husband, who was a high school teacher at the time. He was just getting out of school to go pick up our daughter from daycare. I tried to explain what was going on. Luckily, he already knew I’d submitted that form last week so I didn’t have to explain much. David listened calmly. It was around 5pm. I asked him, ultimately, “what should I do?” After a few moments of contemplation, he said he’d bring Nora home, and we would drive. I immediately threw diapers, clothes, and food into suitcases. I didn’t have time to pick and choose, I just had to throw things in. Eli was awake at this point, and started crying to get out of his seat, so I obliged him and, holding him, continued working. I sat down to breastfeed him right before David arrived home with Nora. We made the necessary pet arrangements. I called my friend Becca, who was in the middle of getting her hair colored, to tell her to “stop everything, Billy Corgan is going to my mom’s house,” and would she take care of my cat? My mystified friend said, “Ok? !” Then, we dropped the dog off at our local boarding place. We loaded up and left at 6pm – in the height of Austin traffic. We could barely make it out of the city and I worried we had missed our window of getting there on time. Eventually, we did make it out, and committed to the long drive. At 10pm, both kids were melting down. Nora asked why we were going to NaNa’s house and said she didn’t want to go anymore. Eli just wanted to be held. We calmed them down, gave them some food (and milk), and eventually, they fell asleep. We pushed on through the night. I had to wear headphones blasting electronic dance music at full volume so I wouldn’t fall asleep and wouldn’t wake the kids. I had to take breaks to interact with the breast-pump and try to feed Eli as well. It was madness, but we made it. We arrived at 7am – 13 hours after we hit the road. Any later, and we would have missed the whole thing. Eli was still sleeping when we entered my mom’s house. I took the world’s fastest shower and tried to do my makeup. I was more tired than I’ve ever been, but I was running on adrenaline. I didn’t even know if Billy would come. I didn’t even know if this was real. My mind cooked up a whirlwind of scenarios. What if they were just coming to make fun of us? I mean, what if they weren’t nice people, what if this was going to be an awful experience? What if my teenage idol didn’t “like” me or acknowledge me or if I didn’t ask the right questions, or look good enough? Little did I know what was going to happen next. At 9am on the dot, the RV parked across the street by the abandoned elementary school. Eli was sleeping and Nora was happily playing with my parents. David and I watched as Billy and his two friends, all impossibly tall dudes, stepped out of the RV and rounded the big wraparound porch to the front of my mother’s house. David checked in with me, “Are you ready for this?” Bleary-eyed, more tired than I’d ever been, I smiled, and my Dad opened the door for them to walk through. I want to stop here and say this: I could have done anything in that moment. I could have exploded into tears. I could have hidden in a corner. But I stood there, faced Billy like he was a normal person, and shook his hand. We explained that we drove through the night, and he was impressed. What followed was Billy Corgan walking around my childhood home, admiring my mom’s myriad collection of antiques, looking into my childhood bedroom (what?! ), sitting upstairs in our informal den and talking to us about his film project. He interviewed my mom and I sat on the stairs and listened. Then, he asked me to come over and interview with him, too. He asked me questions that I had ALWAYS needed to be asked by someone – let alone by my favorite rock star. I can’t divulge much here as we signed a nondisclosure agreement (whoa!) but I will say, it was a lot about my upbringing and my hopes for the future. I told Billy that he was hitting so many huge questions for me, and at the end of the interview, I cried, and he hugged me. After the interviews, Justin suggested that we all take photos, so I have photographic evidence, y’all – and videos. 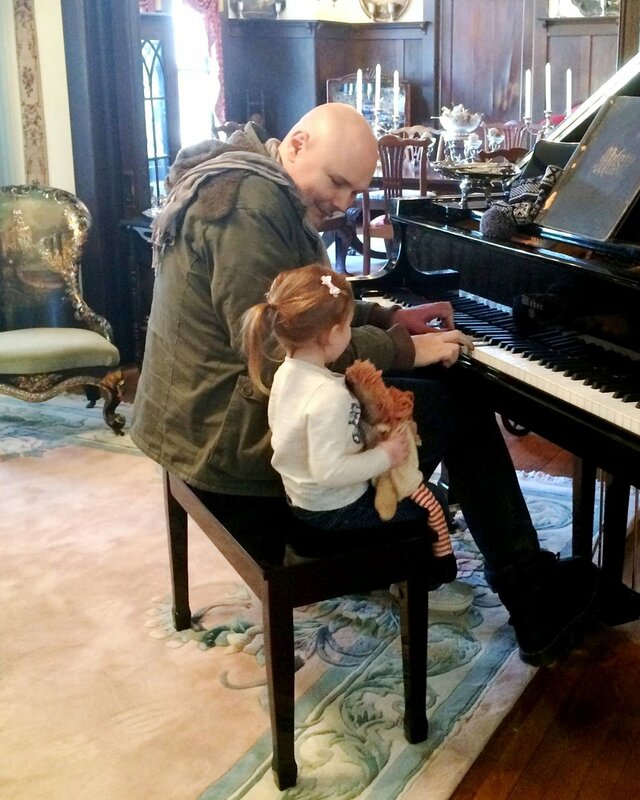 Billy even stepped into the living room and played the piano with my daughter. The visit lasted about two and a half hours. When they packed up and were all done, I went immediately to lie down on the couch and just let everything go. I knew this was something epic, but I had no idea what it “meant” or even how to process it! I messaged my old high school friend on Facebook and we met the next day for coffee in midtown Memphis. I showed him the photos and videos and it was so surreal. But even more surreal was seeing him and talking to him after fifteen years of very little contact. It’s amazing what these big moments in life will make a person do. We stayed at my mom’s house an extra day and then we had to pack it up for the long drive home. I was more thankful for my parents in ways I have never been before. You see, every single moment in my life had led me to this moment. If anything at all had been different, I wouldn’t have been able to make this journey and have this experience. It was close to Valentine’s Day and I had already booked a “crazy” trip to Houston for us to see a Cirque du Soleil show and stay in a hotel for the first time with kids – little did I know that we would be driving back to Texas from the craziest trip of our lives. On Friday, we landed at the Houston hotel and crashed. Staying in a hotel with two little ones and seeing the Cirque show was easy compared to what had just happened. I kept the experience quiet on social media and tried to process it throughout our little weekend together. We finally made it home on Sunday and I can only describe the feeling as that sinking emotion you feel after you’ve planned a wedding and it’s over: you get to the highest heights and then there is nothing left. After I became a mother, I felt like a lot of “what if” doors closed for me. What if I wanted to sleep in ‘til noon and have no one bother me? What if my husband and I want to stay out ‘til 2am at a concert? What if I wanted to just pack up and go on a trip one day? What if I wanted to devote all my free time to writing and writing and writing? I thought all of these what if’s were now impossible. But now I see that nothing is impossible, especially with children – with enough consideration, they can come along for the ride, or they can be left safely with someone else, or they can be right in the mix of everything. Adulting can be super hard, but we can’t let this life get to us. We have no idea what the next day will bring. Since my experience, I have said “yes” to so many things in life and have received a resounding “thank you, here’s more!” from the universe. Maybe It’s all about perspective, but I have asked the universe to bring me exciting opportunities and it has delivered. That’s not to say that I don’t plan out these things, I most definitely do, but I am less afraid to do them now. I am not afraid to ask for what I want and what I need. It’s only when you are knee-deep in uncertainty that you can make that giant leap forward. When you’re unable to think, and there are so many thoughts swirling... When everything you’ve ever done or known is staring you in the face and telling you that you need to back down – but instead, you rise up. 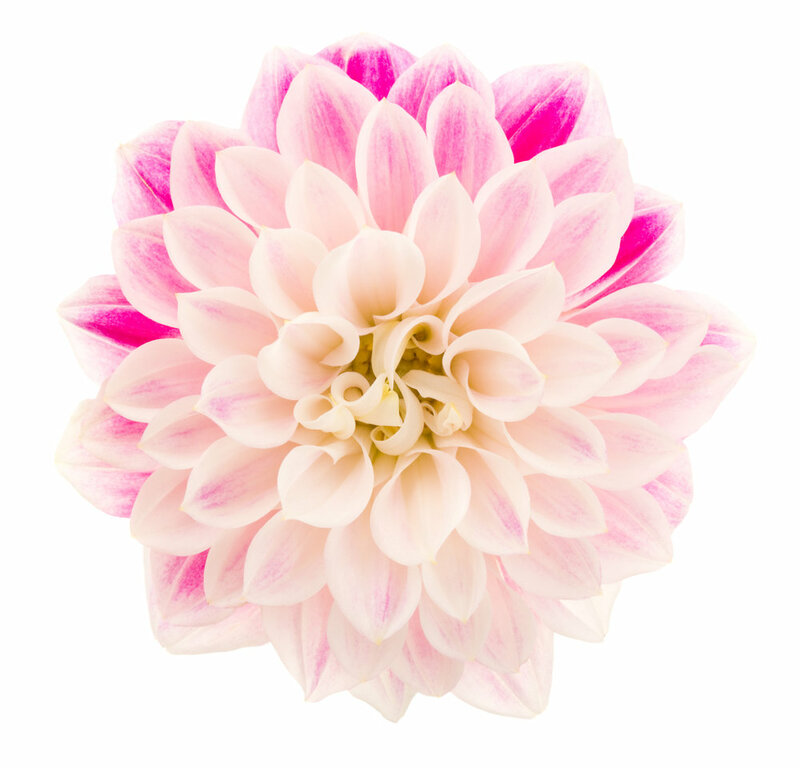 I can only liken it to giving birth – pushing past that point of complete uncomfortableness, to appear on the other end with a tremendous sense of relief and a new life in your hands. We birth ourselves again and again in this life, moving inward and searching, being challenged outside, and finally emerging as something new. There are so many factors that go into getting a person somewhere - physically, mentally, emotionally. Every single thing you do takes concerted effort. Pat yourself on the back for the little things and keep plugging away, because one day that “big” moment will come along and you’ve got to be ready. If any one thing had been different in my life – my job, my husband (how amazing that he helped me get there! ), my kids, my parents, even the place where I grew up, my actual mother’s house, my physical wellbeing that day - ANY one thing, I would not have gotten to experience this. The experience itself was great, but the getting there was the epic part. The getting there was the adventure. And afterwards, now, is the new world created by it.